When the library moved to our present location with its wonderful space, I proposed that we start a library music concert series. Having attended several concerts in the valley, I realized the area was filled with talented musicians that needed venues for performance. It also seemed apparent that we should attempt a collaboration with Aspen Music Festival & School in sharing their student talents during the summer months. The combination of a wonderful room to serve as a venue for concerts, talented valley musicians, and the collaboration with the Festival led to the established music series as you know it today. My encore career has been a most rewarding path. The Board of Trustees and Library Directors have been most supportive of the music series. The community has been so responsive and I owe much to all of you for giving me the opportunity to serve you through music. Thank you to all for a wonderful encore career. Check out Dominion or one of our other games from the new board game collection! Ask us how at the front desk. Technology Classes To suggest a class topic call 970-927-4311 ext 1013 or email cbaumgarten@basaltlibrary.org. To book an appointment for one-on-one help, visit cbaumgarten.youcanbook.me. substituted his own characters for the heroes, villains, and saviors of earlier hero quests. Kennedy brothers and Martin Luther King, Jr. – he had his work cut out for him. Take Star Wars: Episode IV – A New Hope: the hero (Luke Skywalker) leaves his ordinary world (Tatooine) after receiving “a call to adventure” (Princess Leia’s hologram message) and learns he has the special talents of a Jedi. A supportive mentor (Obi Wan Kenobi) offers supernatural aid (light saber) and guidance. Then Luke faces a series of trials to prove his mettle (storm troopers, Jabba the Hutt), survives a supreme ordeal (Death Star, Darth Vader) and returns home wiser and victorious. Lucas acknowledges he wrote Star Wars because he believed our society was in dire need of fairy tales, myth and fantasy – a “new myth” would provide a “New Hope” for an audience that had grown cynical and demoralized. 5-7PM Documentary Nig "Advanced Style"
5-7PM Movies that Matte "At Eternity's Gate"
5-7PM Movie Night: "Rac Extinction"
4-5:30PM Documentary Screening: "How We Grow"
exposed to the Star Wars films as children. Some acted out scenes at home and at school, investing time and creative energy into a fictional universe and characters who became like an extended family. For them, their “best birthday ever” became indistinguishable from the experience of playing with friends, the cutting of the cake – and their new Star Wars action figures. In this way, Star Wars no longer remains just a film; it becomes much more. (which, among believers, can provide affirmation and emotional support), buying and collecting Star Wars merchandise can trigger memories of the past. Accessing positive memories and tapping into nostalgia have been shown to be a critical component of forming a meaningful personal narrative, and the simple act of picking up a toy light saber can return fans to childhood, to a time when they felt happy and secure. Even subtle challenges to a narrative we’ve created about the world and ourselves can be stressful. In response, we’re prone to cling even more tightly to our beliefs. Even if someone didn’t have the rosiest childhood, he or she can still escape to the Star Wars universe, creating an alternate reality where cherished friends, caring mentors and happilyever-afters await. Five years after the Death Star was destroyed and Darth Vader and the Emperor were defeated, the galaxy is struggling to heal the wounds of war. On the run from vengeful Republic forces, Dessel, a cortosis miner, vanishes into the ranks of the Sith army and ships out to join the bloody war against the Republic and its Jedi champions. CAN'T MAKE IT TO MOVIE NIGHT? Watch it in the Library's Micro Theater! Seed Lending Library Not everyone understands how a Seed Library works; how in the world can you return seeds if you've already planted them? That question shows just how much of our early agrarian skill set and knowledge we've lost, because it used to be that everyone saved seeds from one year to the next. Seed saving was not only a necessity (new seed was hard to come by, expensive, and not locally acclimated) but a way of preserving a family's history and ensuring their food security. By saving seeds from year to year, and passing them down from generation to generation, the varieties that thrived in a specific location were like money in the bank, providing a valuable asset for families and the communities they lived in. Today, most of us don't have a clue how to perform this historically significant act of self-reliance and preservation, but your commitment to learning how to use our local Seed Libraries as they were intended will allow you to reclaim and breath new life into an invaluable local food (and family) tradition with deep roots. Using a Seed Lending Library 1. Select seeds from the library based on your level of seed saving skill [green circle] Beginner [blue square] Intermediate [black diamond] Advanced 2. Plant the seeds (using appropriate precautions for the seeds you've chosen) and allow some plants to grow till they "go to seed" 3. Select your best producing plants to harvest and save seeds from 4. Return a generous portion of your saved seeds to help the Seed Library become a selfperpetuating source of locally acclimated seeds with stories that connect users closely to one another, and to the place we all love. READING UNDER THE STARS Journey into outer space all summer long by discovering book lists in Gale's Books & Authors. SIGN-UP FOR SUMMER READING BEGINS MAY 29TH! EVENTS, DATES AND TIMES ARE SUBJECT TO CHANGE. 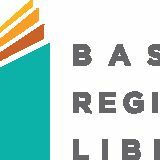 Check basaltlibrary.org/event-calendar for up to date info. Basalt Regional Library's Magazine & Program Brochure. 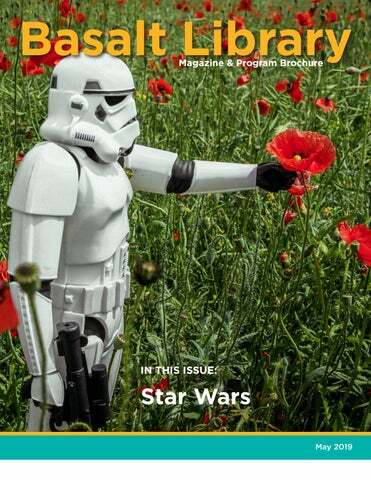 This month features articles and books lists related to Star Wars.